This book met all of my expectations. It was funny, cute, and fast moving. I think this book has an excellent message that everyone needs to hear. It’s a great reminder of how every choice we make has the ability to change someone else’s life. This book also deals with some very relevant topics, like racism, and immigration. Dual point of views. They were amazing. Daniel and Natasha had very distinct voices, something that I feel like is often lost in YA dual POVs novels. I especially liked all of the chapters from minor/side characters povs. I loved seeing that outside perspective and how those characters decisions really affected Daniel and Natasha’s day. My favorite was Irene, we had a total of less than 10ish pages with her, but I found myself thinking about her and caring about her almost as deeply as I cared about the main characters. The plot. The whole book takes place over the course of 12 hours so of course it moves quickly. That being said I never felt like it was rushed. That ending. This belongs in my favorite and not so favorite things. This ending made me cry from sadness and happiness on literally the same page. There’s only one thing that I didn’t like. It’s the one question that is left unanswered. What happened to her and Bev, her best friend? Yep, the f word is used a fair amount. I shed a couple of tears and had to resits the urge to throw the book at one point. Five out of Five hedgehogs. Nicola Yoon, be sure to check out her website. Her debut novel, Everything, Everything is getting a movie! It comes out this year. 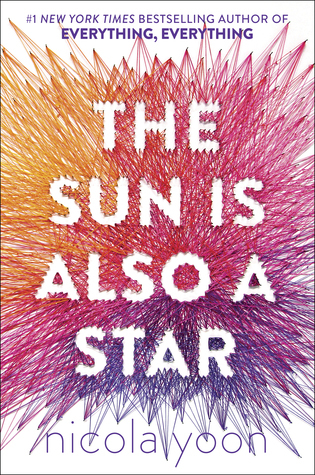 Have you read The Sun is Also a Star? If so who do you think you are most like, Daniel or Natasha?